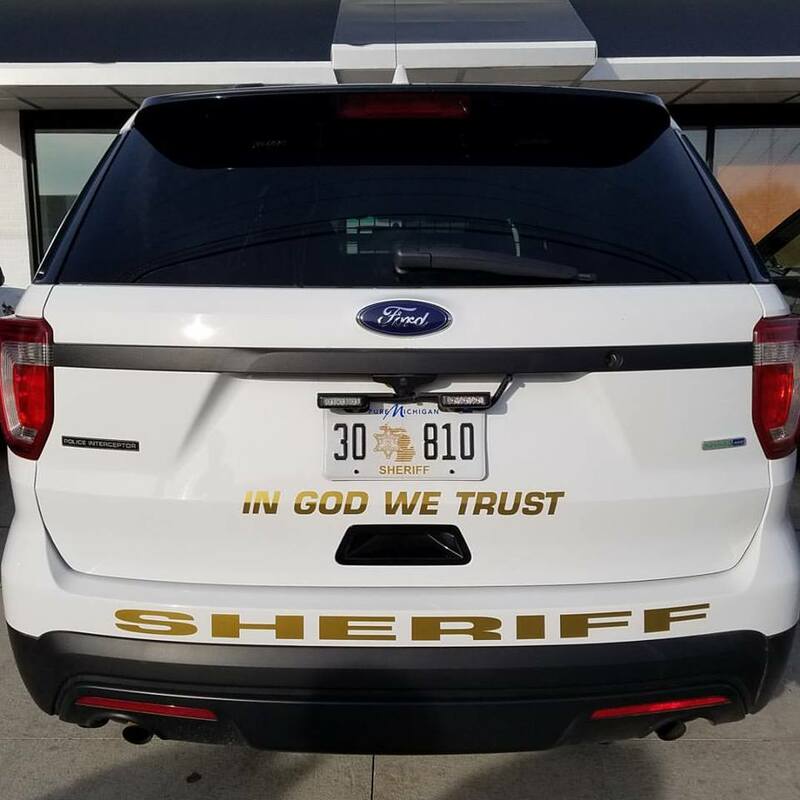 The recently placed motto “In God We Trust” on one of the Sheriff Office’s patrol cars. The Hillsdale County Sheriff’s Office recently placed the national motto “In God We Trust” on its vehicles, raising ques­tions from local cit­izens on whether local gov­ern­ments should incor­porate religion in their oper­a­tions. Sheriff Tim Parker said it was one of his pri­or­ities upon entering office to place the motto on HCSO vehicles, and that it was ulti­mately his decision. “We didn’t go around asking for votes or asking what everyone thought,” Parker said. Parker said the funding for this project came from a source outside the sheriff’s office who wished to remain anonymous. Regardless of the origin of the funding, some cit­izens say they are con­cerned the newly placed mottos violate the sep­a­ration of church and state. Parker does not see it as an endorsement for a spe­cific religion, however, since “In God We Trust” is the national motto. The phrase appears on coins and cur­rency as well as many state license plates. Regardless, Crall said, this decision dis­re­spects the minorities HCSO rep­re­sents. “It makes me wonder what [Parker] thinks about other groups he’s vowed to protect,” she said. According to Parker, the motto does not change the way HCSO serves and pro­tects its cit­izens. It is a rep­re­sen­tation of the officers’ beliefs that a higher being is watching out for them, he said. Hillsdale res­ident Ryan Rad­abaugh agreed. Rad­abaugh and Crall both said Parker should have con­sulted members of the com­munity before making the decision, however. “Instead of acting on a whim, they should have sought public opinion before acting on it,” Rad­abaugh said. Coun­cilman Adam Stockford agreed the decision was a bold move, but said he believes the com­munity should give Parker the benefit of the doubt. 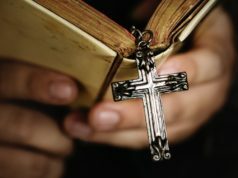 The backlash to this decision is one of many recent attempts across the nation to remove ref­er­ences to God, Chris­tianity, or religion from gov­ernment property. The Oklahoma State Supreme Court ruled in 2015 that the state must remove the six-foot mon­ument of the Ten Com­mand­ments from its capital building, noting it vio­lated the state’s con­sti­tu­tional ban against the use of public funds or property to benefit a religion. Sacra­mento attorney Michael Newdow filed a lawsuit in November 2005 against the U.S. gov­ernment in an attempt to remove the motto “In God We Trust” from all national cur­rency, claiming the national motto is uncon­sti­tu­tional. Crall agrees and said the national motto rep­re­sents only one religion, which she said is dis­crim­i­nation. “What you do on Sunday has nothing to do with your job,” Crall said. Another gov­ernment entity that is showing total dis­re­spect for the cit­izens of Hillsdale who are not god believers. They could have used a motto/saying that showed equal respect for ALL cit­izens, like “We the People” or “E Pluribus Unum”, both of which unites and respects all cit­izens. Instead they chose a motto that excludes some cit­izens, causes dis­sension and divides cit­izens. So sad .…. Although I agree with you on prin­cipal, as far as you went, I still see problems with YOUR sug­ges­tions which could be as dis­con­certing to some as “In God We Trust” is to you. For example, if they had used “We the People”, some who have a dif­ficult time qual­i­fying what “people” means may be dis­ap­pointed. I know several “people” who have accused others of being inhuman, therefore not worthy of the benefit of being people. As to “E Pluribus Unum”, how would you address the dis­pleasure of the Thra­cians or Mace­do­nians among us at having a Latin phrase on our patrol vehicles? I am Robert Ray, Exec­utive Director of The Original Motto Project, a non­profit orga­ni­zation that advo­cates for the prominent display of the Latin motto E Pluribus Unum (From Many, One) or We the People from the Con­sti­tution as one that rep­re­sents the truly inclusive nature of American society. Our message is one of inclu­siveness: it takes all points of view, and some­times the quarrels between those com­peting view­points, to make America the richly plu­ral­istic society that it is. In God We Trust, though it is cur­rently enshrined by law as the official motto of the United States, is inher­ently divisive. 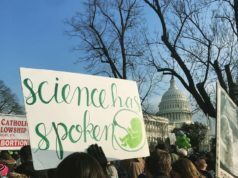 Not only does it exclude a sig­nif­icant minority – i.e. the non­re­li­gious – but it also excludes those reli­gions that believe in mul­tiple gods, as well as those that believe in none (like Bud­dhists). Fur­thermore, it is an unfor­tunate fact that many gov­ernment agents and agencies who display the motto believe it to be an overt endorsement of Christian belief. When used in such a context, In God We Trust vio­lates the most sacred of American prin­ciples: the sep­a­ration of church and state. E Pluribus Unum, we believe, is a motto that encap­su­lates the variety of expe­rience and belief in this great country. It first appeared on the pro­posal for the seal of the United States in 1776, where it rep­re­sented the union of colonies, who, despite deeply rooted dif­fer­ences amongst them­selves, united to throw off the shackles of oppressive and arbi­trary gov­er­nance. The seal promi­nently dis­playing E Pluribus Unum, was approved by con­gress in 1782. We the People are the first words written on the doc­ument that offi­cially formed the united states of America. Those words like E Pluribus Unum, became the glue that has held this nation together though war and peace. They are the epitome of what our founders wanted for this nation. While you may still choose, of course, to display the motto In God We Trust, we here at The Original Motto Project humbly ask that you con­sider a com­promise that can satisfy both view­points on this issue: mount E Pluribus Unum or We the People in an equally prominent and hon­orable place alongside In God We Trust. Why can you not stop trying to force your religion onto everybody else? That is no dif­ferent to a dic­ta­torship as you would have under a theocracy. You are forcing all others to bow to your spe­cific and par­ticular religion/mythology. We live in a demo­c­ratic republic under a Con­sti­tution which by def­i­n­ition is sup­posed to defend all peoples’ rights, not just the majority. Why do you feel jus­tified in abro­gating other people’s rights? These stickers/signs, on gov­ernment vehicles and facil­ities, are a clear dis­crim­i­natory act against me, and my family! These stickers/signs exclude a whole segment of American cit­izens from the com­munity. They are divisive, and the offices using them con­sciously know that this is a divisive act, and are pur­posely con­tinuing to offend the cit­izens in their com­mu­nities. Are these the acts of true Amer­icans? 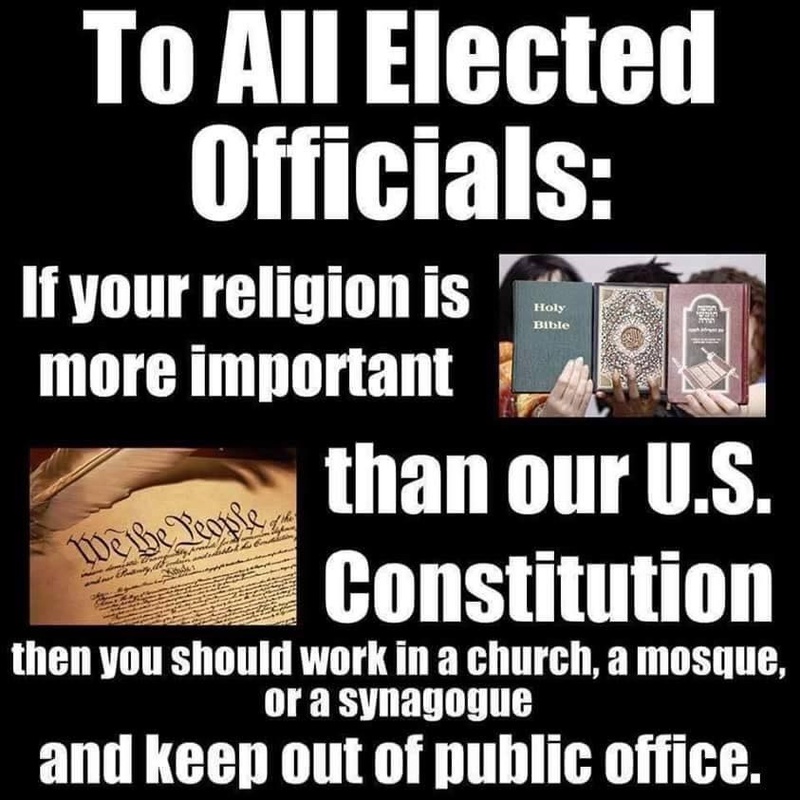 Putting your religion above the Con­sti­tution and the rights of sup­posedly fellow Amer­icans? So it was one of Parker’s pri­or­ities upon entering office to place a divisive Christian motto on all his sheriff cars? Maybe because it’s a theo­cratic reac­tionary motto that came about from the Red Scare in the 50’s and pro­motes the Judeo-Christian worldview through gov­ernment rather than letting the indi­vidual decide what to believe, which is a vio­lation of the First Amendment? That ring a bell, Sheriff? Do they know who van­dalized the Squad Cars with reli­gious graffiti? When can the Cit­izens of Hillsdale expect arrests?